Garden birds such as house sparrow, starling and song thrush, once common, are now threatened enough to need an official ‘action plan’ (UK Biodiversity Action Plan Priority Species, 2007 review). This is just one example of what is happening around us. As we learn more and more about the damage our way of life – with its plastics, pesticides, light pollution and so on – is doing to the Nature around us, let’s just stop and think: as I am part of the problem, could I also be part of the solution? And the answer is ‘yes’, in many different ways, but here we’ll focus on what we can do at home as gardeners, how we can make our gardens more wildlife-friendly. No need to go for total, wholesale re-wilding (unless you want to). Your garden can be as ‘untidy’ or as neat as you like. Hedges, trees, shrubs and flower beds all provide wildlife habitats. In fact, many gardens need only a few small adjustments to greatly improve their wildlife-friendliness. With a bit of thought, any garden can become a mini nature reserve. There are, however some basic rules to follow, so let’s look at those. I will also give you lots of tips on how to follow them. By the way, if you don’t recognise some of the plants or animals I mention, a quick search in online Images will help you with that. Our ornamental plants as well as the weeds amongst them give small animals shelter from the elements, some protection from predators and food. So, let’s leave some weeds like stinging nettles or garlic mustard for butterflies to lay eggs on. Surely, we could live with some weeds in our lawns? The purple-flowering self-heal, clover, trefoil, and even daisies and buttercups produce nectar and pollen for insects. A great thing to do is to leave a sunny patch, or strip, of lawn un-mown right up till late summer. A whole host of mini-beasts will appreciate this for shelter, and at least six species of butterfly lay their eggs on long grass stalks. In the autumn, any leaves that you rake off the lawn can be placed as mulch in the borders, or in a pile somewhere out of the way. Ground beetles and centipedes - that devour garden pests - will hide there. The leaves will slowly break down, releasing nutrients into the soil. Ask your local tree surgeon for some logs and make a pile under the shrubs. With luck, local frogs and newts will spend winter there. If you garden soil has large pieces of flint, that’s good news! Well, any stone will do. Rock piles and drystone walls, with their nooks and crannies, give perfect shelter to many creatures. Yes, you may find a few slugs and snails there, too, but even they are food for someone else. If you have fruit trees, don’t put all of the unwanted apples and pears on the compost heap (please, do have one!). Leave some on the feeding table or on the ground for the birds and the late-emerging butterflies. Make your flower border in a sunny sheltered part of the garden. Choose plants that flower at different times for continuous supply of nectar from early spring through to the autumn. Go for simple open flowerheads where the nectar is easiest for the insects to reach. Or for ‘bobble’-types like those of cone flower or sea holly. A label may tell you if a plant is particularly good for wildlife (more about this at the end of this article). In the autumn, seedheads left on plants such as ornamental grasses or sunflowers, not only look interesting to us but provide high-energy food for both resident and migrating birds. Berries on shrubs do the same. Birds will greatly appreciate berberis, mahonia, firethorn, holly, even the humble elderberry. And of course, we should be making the cold months easier for the birds by feeding them throughout winter and spring. Just remember to keep it up once you’ve started, because they will learn to depend on it. Did you know that it is a criminal offence to remove or deliberately destroy an active nest? That’s a nest that is being built or has eggs or fledglings in it. Ideally, we should not trim hedges during the peak nesting season from the beginning of March to the end of August. If we cannot be sure that there are no active nests, let’s leave it till the autumn or winter. Just like us, our garden creatures need to drink, and sometimes have a bath. And some, like frogs, newts and dragonflies, lay their eggs underwater. The ideal setup is a wildlife pond, large or small, with plants growing in and around it, and with a gentle slope on one side so the newts etc. can get in and out easily. 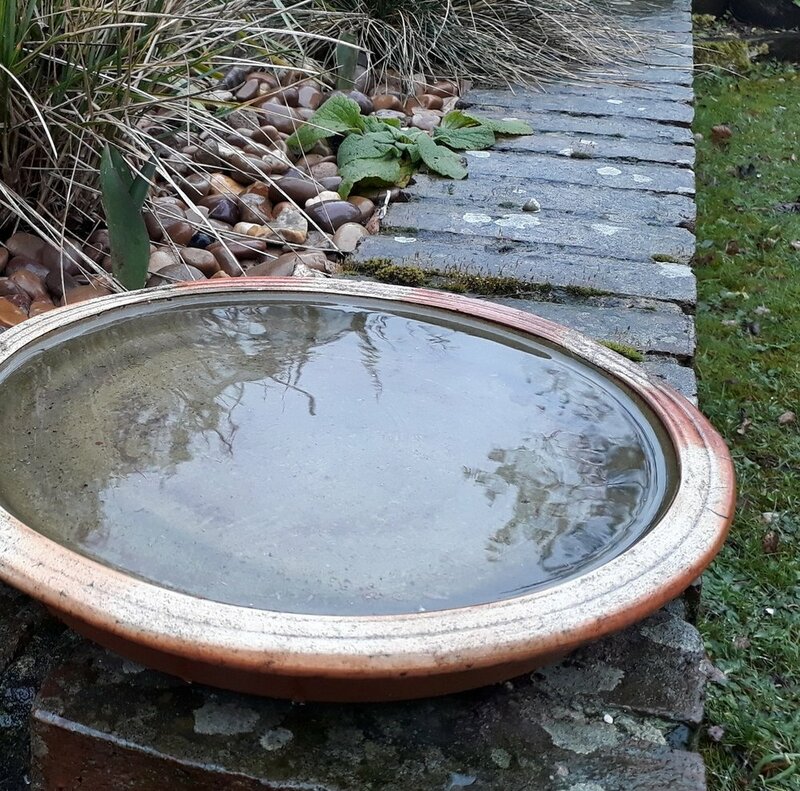 Failing that, any source of fresh water – a bird bath or just a shallow bowl - will be hugely beneficial but it must be regularly topped up. Some words of caution, though. Make sure that your pond or pool is safe for young children, if they happen to be around. For many decades, farmers and gardeners have been targetting some wildlife species with a potent array of poisons. The result is that many creatures once common in our towns and countryside are now seriously threatened. I mentioned the birds in the introduction but the honeybees are another well-known example. A balanced garden is one where no one species multiplies so much that it gets out of control and becomes a pest. As a result, a balanced garden needs little or no intervention by the gardener. In practice, however, this rarely happens. Most of us really don’t like to share our fruit and veg with aphids and slugs, however few. So, if you must use them, keep it to the absolute minimum and never ever spray plants in flower, not even roses. The problem with garden chemicals is that they are not selective enough and they kill the goodies (the pollinators and the predatory insects) together with the baddies. And when there are not enough insects in a garden, the birds have to fly elsewhere to find food. Fortunately, there is a whole lot of tried and tested organic methods of pest control that don’t involve harming our garden allies. And, until that perfect balance is reached, let’s just accept some damage - or bring in better, more resilient plants. Many people have lost their front gardens to car parking and use weedkillers to control the weeds and moss between the paving blocks. The long-term effects of those chemicals on the soil creatures are as yet unknown but the scientists are expressing concern. Yet, there are simple non-chemical ways: a patio-knife for weeds, a stiff brush and water for the moss and algae. And finally, I want to come back to the question of plant labels telling you when a plant is considered to be particularly good for pollinating insects. A recent (2017) research showed that 70% of the plants that people buy in garden centres contain traces of neonicotinoids, that we know are harmful to bees. This suggests that gardeners may be unknowingly poisoning pollinating insects in their efforts to help them… Fortunately, many garden centres have taken this on board and promised to work closely with their suppliers to make sure that this situation changes. But until we can be sure that we are not adding to the problem, the advice from the charity Garden Organic is to buy plants from organic suppliers (that can be found online) or do your own plant propagation.